With July 4th right around the corner (Independance Day and overstocks of fireworks), we set out to answer the question on everyone's mind: Can a computer survive an explosion from a 1.5 inch artillery shell? 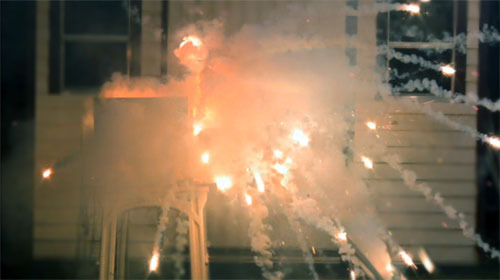 We built a fully functional PC and exploded an artillery shell firework from within its case. 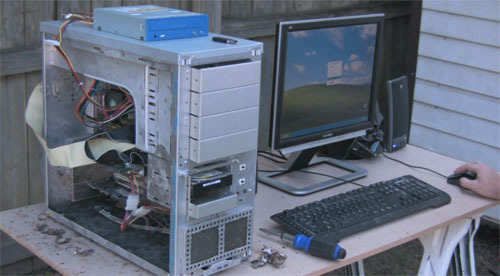 The PC was be subjected to shock, pressure, heat, and amputation of components; survival seemed most improbable. A modern computer would have been awesome to use for this project, but that would be like setting money on fire, right? 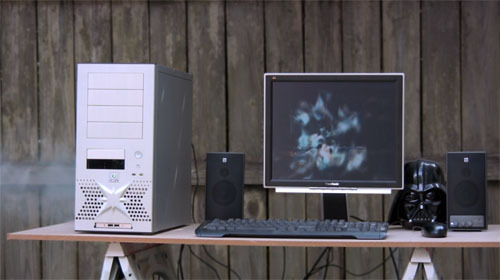 We looked around the ol' closet for some old parts and found an eight year old gaming rig. We were going to try this project using Windows 7 RC 1.0 (atm, Buildegg = total Win7 fanboi), and thought we would be successful, but we could not get through the installation. 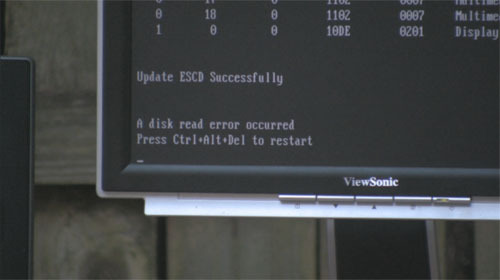 So we reverted back to Windows XP, and chose to use 3dMark2001SE as the software to be running during the explosion. The artillery shell was placed inside the case, at the bottom, in the center, and in an orientation so that the first propulsion charge would shoot the shell up. We ran the wick to the rear of the case, and out through a vent hole. ... not as loud of an "bang" as we were expecting, but that may be because the artillery shell packaging did not label which shells had what kind of effect. It turned out we used one of the "explode then crackle" shells. Nevertheless, the result was ultimate carnage. We found the Lian Li case completely dismantled. The front panel, and every 5.25 bay cover, were strewn upon the ground. Both side panels were blown out; now mind you, even though we didn't use rear screws, there were relatively massive clips and hooks holding those panels in place, all of which were bent by the explosion. 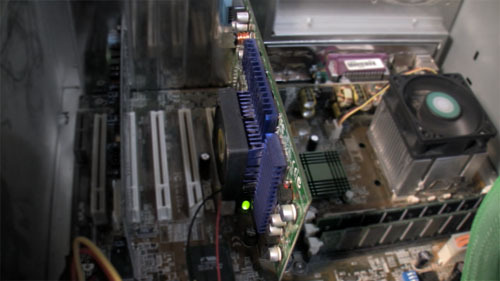 The video card and sound card were half way out of their AGP/PCI slots. The case, and all of the components, were very hot (almost too hot to touch). There were char marks and smoldering fragments throughout. The outlook for this old gaming legend was grim. Did it survive? After the blast, the LCD panel went dark from no data. The power LED on the case was blinking, instead of being constantly on. We pulled the plug to the PC, brushed out any fragments, and reinserted the expansion cards. Power was restored, and we turned on the computer. As the power button was depressed, we were prepared for sparks and/or total failure, but instead we were greeted with spinning fans, POST information to the LCD, and even a "all is well" beep. It was really un-freakin-believable. There was a casualty however; other than the sound of fans, the first thing we noticed during that first boot was the loud, consistent clicking of a destroyed hard disk drive. Western Digital 15 gigger... rest in peace. We were not exactly prepared for the system to be POSTing, as it caught us off guard. We grabbed the last IDE drive laying around, hooked it up, and we were installing XP on a just recently blown up computer. Can a computer survive an explosion? New question: Can a computer survive an explosion, and continue running? We had time for another round. Why did the computer shut off during the explosion? An obvious answer would be the destruction of the hard drive, but there were other factors that could have caused the crash, like the heat and the movement of the expansion cards. In an effort to protect the drive, we mounted the next artillery shell up in the 5.25 bay area. Also, this "new" drive was a WD 60 GB; last known to be in good shape (that 15 gig drive was really old). The expansion cards screws were torqued down tight. We ran the wick out the front of the case, sealed the case up, started 3dMark, and blew the crap out of the PC again. This time the artillery shell firework was not a crackler, it was a one that would have lit up a neighborhood. The blast was so bright, the cameras were overexposed for most of the explosion. The frame that the 3dMark demo was on during the blast remained on the LCD panel, definitely a triumph over the first blast, even though that frame remained frozen on the screen. Other than that, the aftermath was similar to before... utter devastation. Miraculously, the PC started to boot again after this second explosion. As the system tried to boot from the hard disk, we unfortunetly learned that we had lost another drive. Everything still seemed fine, but we did not have another IDE drive to continue testing. 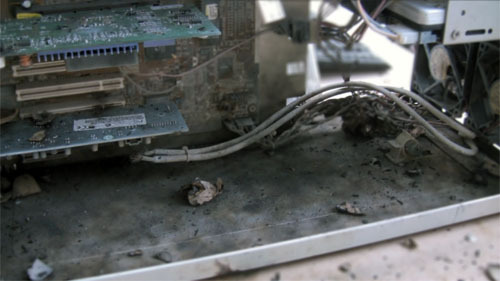 Before we started this project, we thought the hard drive would be the last thing to be affected by the explosion. Of course, we were thinking about it all wrong; even though the drive is enclosed in a seemingly indestructible shell, its mechanical nature makes it susceptible to shock. 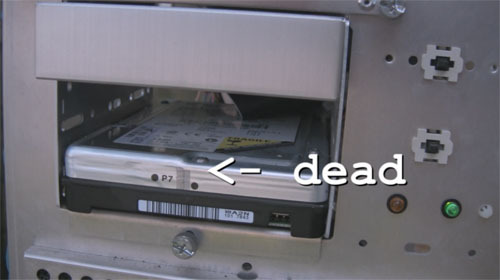 Be it shock, pressure, or heat, so far the hard drive does not survive, and is the weakest link. Have a PC continue to run a game demo / benchmark as a 1.5 inch artillery shell (firework) is exploded within the case. Spare IDE drives are on the way. The project will be continued under Part 2. The project was concluded in ‘part 2’.